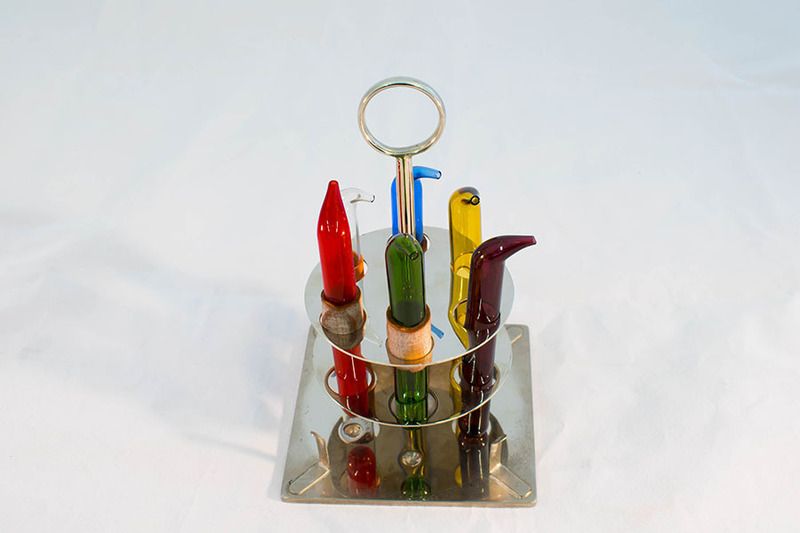 For holding various ophthalmological solutions. 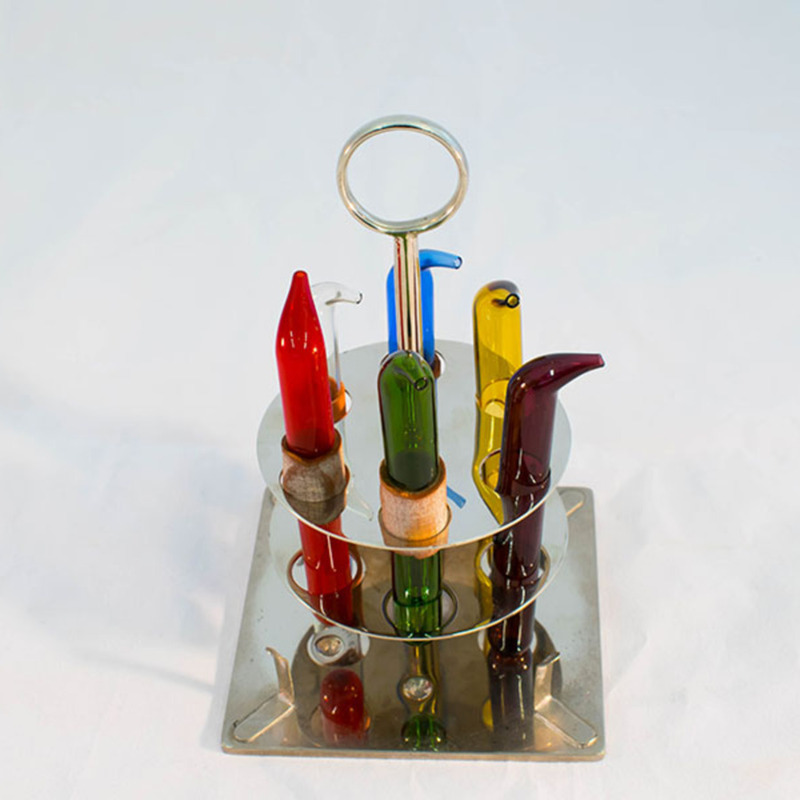 Consists of six open-ended pipettes of various colours retained in a metal stand, with glass domed cover. 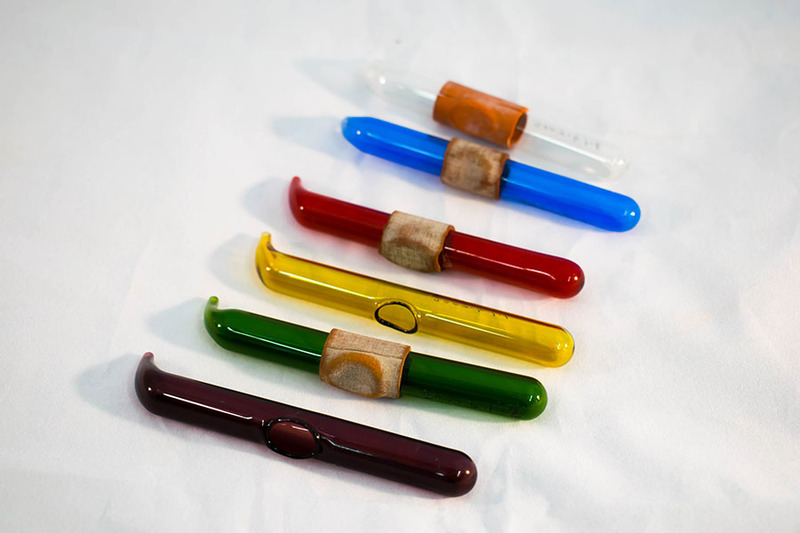 Used to allow the Ophthamologist to select topical drugs easily and safely, as the solutions were effectively colour coded. Pipettes/dropper bottles: Six in number. The glass cylinders were uniform in diameter, with an ovel aperture (1.1cm x 0.85cm) in the glass wall, about mid length. This was covered by a rubber membrane, to give the user complete control of the solution delivery. Metal stand: Consists of a square flat metal base, 10.28cm in size. Central metal column, 0.64cm in diameter and 17cm in height, ending in a lifting ring 3.1cm diameter. Two metal discs 8.25cm in diameter are incorporated into the central column 3.4cm apart, each with six disc cutouts 1.74cm in diameter, to retain the glass pipettes. Glass dome, retained by four spring clips located on the stand base, is 18cm in height, by 9.5cm in diameter. Clear glass, 0.025cm thickness. Pipettes/dropper bottles: 1.25-1.28cm in diameter, 10.5cm-10.8cm in length. Central metal column: 0.64cm in diameter, 17cm in height. Glass dome: 18cm in height, 9.5cm in diameter. 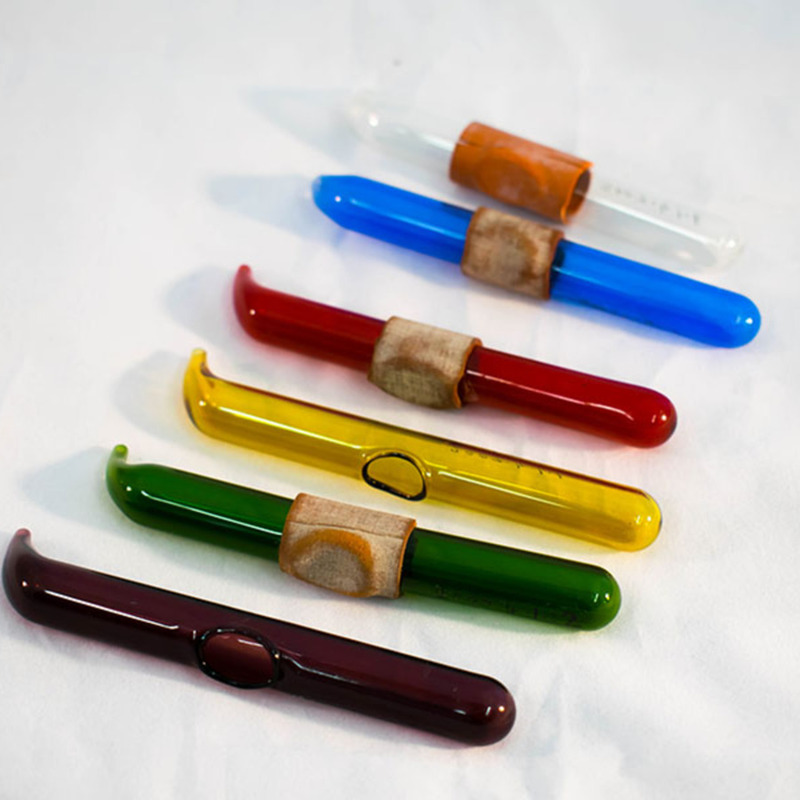 “Ballantyne's Pipettes,” Heritage, accessed April 23, 2019, https://heritage.rcpsg.ac.uk/items/show/262.